Spent a couple of hours cracking hazelnuts to produce 200g. Roasted in a tin for 5 mins at 180C to loosen the skins and brown the nuts a little. Left to cool then rubbed off the skins between my hands. Ground 100g to a fine(ish) consistency and set aside. Placed remaining 100g in a pan with 100g granulated sugar and put on a low heat until sugar had caramelised. Turned out onto a board and left to go cool. Broke of a few whole nuts and reserved for decoration, then roughly blitzed the rest and voila, my first attempt at praline was a success – phew! Creamed 225g unsalted butter with 225g light muscovado sugar for ages. Sifted in 180g flour (160g wholemeal, 20g buckwheat), 2 tbsp cocoa, 1 tsp baking powder and 1/2 tsp bicarb of soda. Stirred in 100g ground hazelnuts followed by 75ml Greek yogurt and finally 50ml strong coffee. Divided mixture between two 21cm cake thingies and baked for 25 mins at 180C. Beat in 1 tbsp strong coffee until mixture was smooth. Stirred in 50g of praline. Spread this over one half of cold cake, then placed the other half on top. Melted 80g plain coffee chocolate (I used the 55% Coffee Affair from Chocolate and Love), 10g unsalted butter and 40g double cream in a pan over hot water. Left to cool slightly then poured this over the cake top and spread to the sides. Covered this with the remaining 50g of praline and the reserved whole pralined nuts. There is no other way to describe this cake other than lush. Different layers with their different tastes and textures made for a wonderful whole. It cut well and had a lovely moist but light texture; it tasted delicious and the crunchy caramelly nuts were irresistible. The coffee came though quite strongly with the chocolate taking a back seat, but the wonderful taste of roasted hazelnuts predominated and lingered on long after the coffee had disappeared. In the end I made cheese scones rather than fruit ones as I thought something savoury before the cake would be a better pairing. But if it hadn’t been for those fruit scones, I would never have proceeded down this route. Much as I shouldn’t preen, I was exceedingly pleased with this creation and it would make a great celebratory cake for the coffee or hazelnut lover in one’s life. CT says if the lover in your life doesn’t like coffee or hazelnuts, it may be time to throw your net further afield. That looks delicious, Choclette. A fine use of a good combination of flavours! Choclette, you had me at caramelised hazelnuts. Yum. Oh that comment by CT made me guffaw ( and I was trying to swallow a gulp of coffee at the time!) There was almost consequences. Dare I say that the cake looks like it might be one your best yet, although obviously there is a lot of competition for that spot. The combo of praline, hazelnuts, coffee and chocolate – that might just push me over the edge. Well done on the cracking of the nuts. I was thinking about using some walnuts from a friend’s tree for a coffee and walnut cake, but I haven’t managed to find the cracking time yet. Thank you for the mention and the big compliment, you are very kind. Mmmm that looks amazing! I agree with your savoury choice of the cheese scones also! Oh by the way, I heard on the radio yesterday that the chocolate company “Green & Black” are looking for a “chocolate taster”, I thought of you instantly haha! looks delicious – I love praline and chocolate though I would leave out the coffee – for my own good! I agree, the comment by CT had me in stitches. Alas, I haven’t come up with anything for We Should Cocoa this month (various reasons, but chiefly because I haven’t been able to find any hazelnuts! Maybe there’s a nationwide shortage that I haven’t heard about… or there is suddenly an army of NZ food bloggers about to unleash their recipes on you). Anyway, this recipe takes the, err, cake. Delish! Choc I think CT might be on to something there. Lucky for me my lover likes hazelnuts and coffee…phew! That cake looks suPERRRB! Layers of sweet goodness. Oh man – coffee, chocolate and hazelnuts – a combination made in heaven!! Lush indeed… lush, lush, lush! A wonderful addition to the We Should Cocoa collection – don’t suppose you could pop a slice inthe post to me lol. I must extend thy digit and post my entry too!!!! Thanks Suelle – it’s so nice when things turn out as one had hoped. Dom – oh do join in, I’m looking forward to seeing what you come up with. The secret is to make the cake and then give it away – a case of do as I say rather than as I do I fear! Gillian – yeah, they were the best bit. Kath – enjoyed reading your comment, made me giggle. Thanks for the compliments. The weird thing is I don’t actually like coffee. Oh do get cracking with those nuts, it’s very satisfying making something when you’ve put so much effort into it – but you’d know all about that. Catherine – I did have a peek at the application form, sort of had to really. Sadly, don’t think I’m quite in that league. Johanna – you don’t like coffee or you won’t drink it for health reasons? Just wondering because I’m not really a coffee fan. Liz – thank you. Once for my recipe book – te he! Oxslip – I was a little surprised by the OMG, but it made me laugh. Friends were just lucky I was on holiday. KitchenMaid – And I was looking forward to your contribution 🙁 Nutella or equivalent is allowed. Haven’t yet been inundated from down under! CityHippy – thank you and glad you don’t have to go a-hunting. Aforkful – cor will do nicely. What a fabulous first praline cake! What a cracker that one is Choclette. I adore coffee in cakes and praline is just one of my favourite things in the whole world. But you like hazelnuts – thank goodness! Juts brought from good hazelnut, will give ur cake a go! scrumptious! Joanna – thank you. Now I’ve got my head around making praline and realising it’s not that difficult, I shall be repeating the process. Have you made it at all? If so, any tips? Kath – phew, yes, that’s lucky indeed. Ananda – glad you like the look of it. Chocolate, coffee and hazelnut! Gorgeous! Fab looking cake and a real labour of love, by the sounds of it! …LUSH indeed! That whole cake would be gone in seconds if it were in front of me right now. Mmmm. 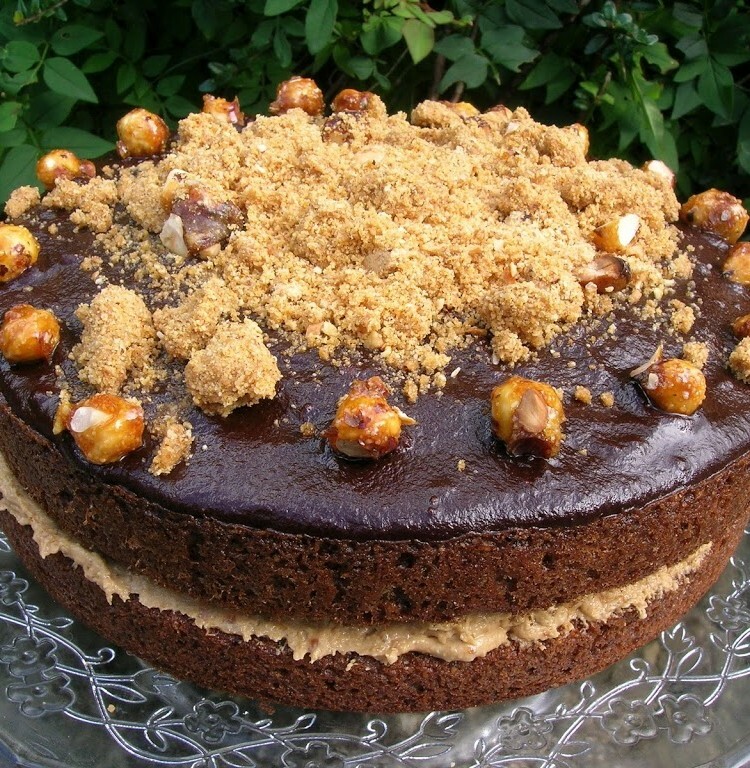 Well done on doing your hazelnuts – time clearly well spent and well rewarded with this absolutely fabulous cake! I love praline and could eat a slice of your cake now! Sushma, FoodyCat, CC, Hazel & Margaret – thank you all for your kind comments. Wow, the flavours in this cake sound intoxicating. What a beautiful treat. Thank you Emma – I shall be making that praline again for sure. Waw!! Your filled huge cake looks so pretty & fabulous too! Well done on making the praline. The cake looks delicious.